Before sending any question about the Northern Lights to us, please read this page. Probably you will find the answers to your questions. How often are the Northern Lights in the sky of Lapland? You can check it in our Aurora Movie gallery. At the moment (early April 2018) solar activity is approaching the minimum of the cycle. The geomagnetic activity in past months has been mostly origin from the long living coronal holes of the Sun, so the occurence of the Northern Lights has strongly followed the 27 days solar rotation (see explanation below). There will be one more geoeffective region in the Sun before the of the season in couple of weeks. This same region was origin for the auroras of mid March. 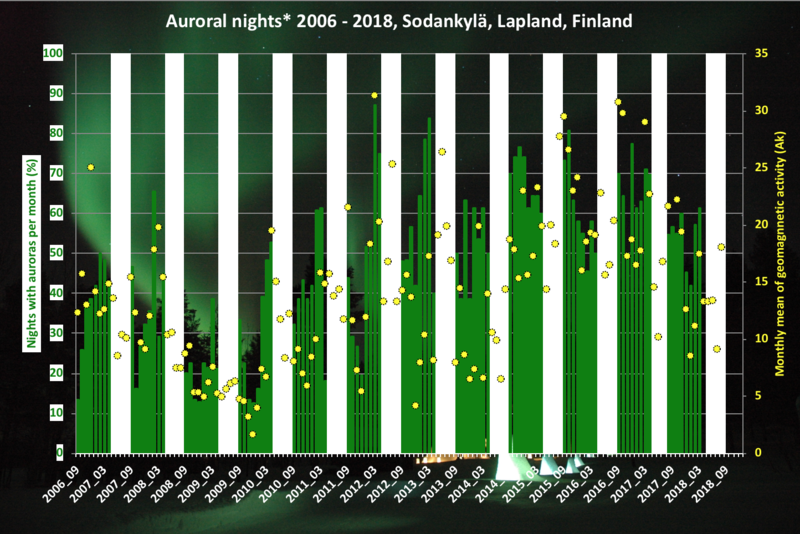 During the minimum phase of the solar activity the probability to see Northern Lights in Lapland is still good allthough the auroras stay mostly in the northern sky. Often auroras occur as quiet arcs in the north like auroras in 5-6 March 2018. 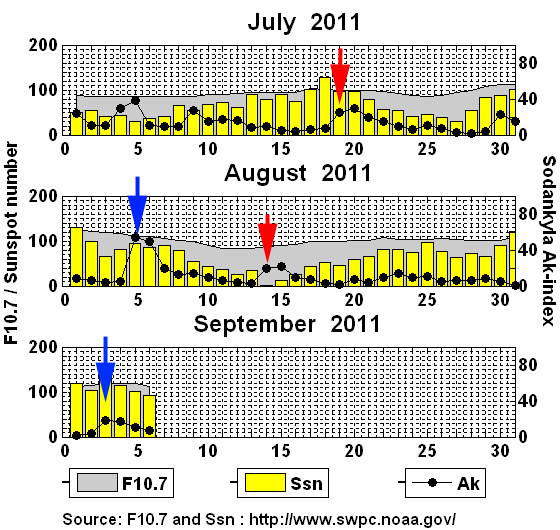 The statistics shows geomagnetic acvity (yellow circles) observed at SGO. The green bars show amoung of the nights the auroras could be detected from SGO iCCD camera. White bars shows time of the bright nights (late Apr - mid Aug) when the Northern Lights are not visible. Note, the all-sky cameras detects the Northern Lights also trough the clouds, so even the camera site is cloudy, we get information about the occurence. Cloudiness can varie lot, so the location and the weather has also important role in the hunting of the auroras. Is it possible to have a tour at the observatory and see the Northern Lights? The observatory does not have facilities to serve tourists. We are an independent department of the University of Oulu and our main task is geophysical observations and related research including the Northern Lights. We do not have public opening hours at the observatory and we do not work during evenings and nights when the Northern Lights are in the sky. Note: Sodankylä is 350km north of Oulu and 130km north of Rovaniemi. Is it possible to get a guided Northern Light safari from the observatory? No. We do not have safari services. If you are planning a trip to see the Northern Lights, there are available guided Northern Light tours from different ski resorts ( Pyhä-Luosto, Saariselkä, Levi, Ylläs) in Lapland. Check their webpages for guided safaris. Also there are many destinations like Kakslauttanen, Levi and Rovaniemi with accommodation possibility in glass igloos, which have planned for the comfortable watching of the Northern Lights and night sky of Lapland. Also there are more specific destination for photographers. SGO is not able to take care visitors. Which time of year I can observe the Northern Lights in Lapland? The season of the Northern Lights starts in the end of August when nights become darker. However in the start of the season nights are short and just the darkest moments are suitable for observing the Northern Lights. But the days become shorter and shorter towards December when the polar night of the norhern hemisphere covers the Northern part of the Scandinavia. In the end of October when time is shifted from summer time to normal time Magnetic Local Mignight is earlier and also dark falls earlier. The auroral season continues until late April when the nights are too bright to see Northern Lights. Can I see the Northern Lights anywhere in Finland? Yes, you can, but the probability of seeing Northern Lights increases when you travel further north. The auroral oval, usually about 2000km from the magnetic North Pole, expands during magnetic storms. During a regular night the auroral oval covers northernmost Scandinavia and Northern Lights are visible in Lapland. Finnish Astrnomical Assosiation URSA has observation website where the current aurora observation can be seen from Finland. This is specially good service in Central and Southern Finland, where are most of the observers, but works also for the Northern Lapland. Usually auroras observed in Central Finland are actually above Lapland. See: Taivaanvahti. Service is available in Finnish. How to get a forecast for the coming days? The source of the Northern Lights are particles originally from the Sun. The particle flow called as Solar wind varies all the time. Monitoring of the activity of the Sun and Solar Wind gives information about approaching disturbances in Earth's magnetosphere. You can get forecasts for the coming days from, e.g., SpaceWeather.com. And what about long-term forecasts? The lifetime of the active regions on the Sun varies. Sometimes the active regions stay alive for a few months. Because the Sun rotates around its rotation axis in about 27 days (note: the Earth does it once per day) the active region faces Earth about every four weeks. Check the activity 27 days backwards if there were Northern Lights on the sky. The same source can cause them again. This can be seen also in the geomagnetic activity, which is monitored by the observatory. The plot below shows three month activity cycle. 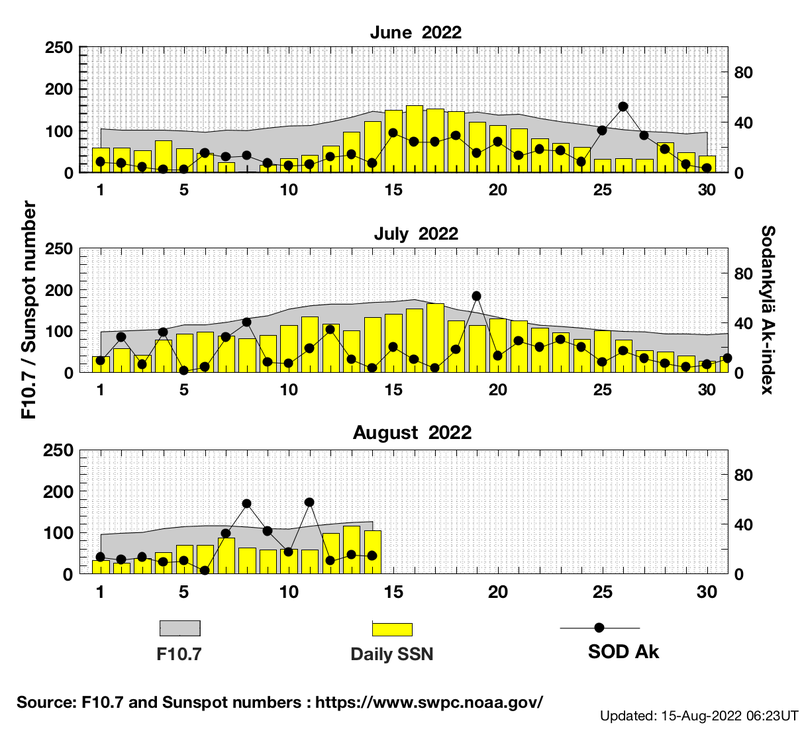 If the Ak has increased suddenly, usually it increases again about 27 days later (see: current activity) with auroras. Below is the present activity level and count 27 days (or even 54 days) forward and book your trip. Note, it still can be cloudy, but the propability to get the Northern Lights is higher. What do I need to take into account when I try to catch them with my camera? Wear warm clothes so you can stay outside waiting for the northern lights! Keep spare batteries warm in a pocket. Use a tripod if possible. It is important not to move the camera during the exposure. Use the manual mode of your camera. Set the sensitivity value to ISO 400 or higher if possible (Note: digital compact cameras usually give noisy pictures at high ISO settings so a system camera is better). If you still use film, an ISO 400 slide film is a good choice. Use a wide-angle lens set at the smallest F-value available. F2.8 is already good. Smaller value means bigger aperture (more light) used for exposure. Start with a reasonably long exposure time (20 seconds). In addition to SGO real-time page, where I can follow present status of the Northern Light activity? NorthernLights apps in AppStore: AuroraWatch, Salla Northern Lights, AuroraSaurus. Some apps are meant for limited region. Where I can get more info?